Merrymaking was not encouraged in 1621. While the Pilgrims are well-known for celebrating the First Thanksgiving in 1621, Christmas that year was a decidedly Grinch-like affair. The Pilgrims, a group of Puritan Separatists, did not observe religious holidays because they believed celebrating Christmas and Easter was not specifically sanctioned in the Bible. When they came to the New World, they sought to abandon traditions that they believed interfered with the sanctity of Christianity. They found European Christmas traditions — which included loud caroling, public drinking, feasting, and other rowdy behavior — deeply offensive to religious worship. The Pilgrims arrived on the Mayflower on Dec. 21, 1620, just before the holiday. Christmas Day passed like any other, with men leaving the ship to build houses. Monday, the 25th day, we went on shore, some to fell timber, some to saw, some to rive, and some to carry, so no man rested all that day. The passengers who remained onboard did enjoy some beer from the ship’s store that night, but that was the extent of the merrymaking, according to the journal. The next year, a second group of colonists, mostly bachelors, arrived in Plymouth in November 1621. Unlike their predecessors, these colonists did not come solely for religious reasons, but were seeking financial opportunity. One the day called Christmas day, the Gov called them out to work, (as was used,) but the most of this new-company excused themselves and said it went against their consciences to work on that day. So the Gov told them that if they made it matter of conscience, he would spare them till they were better informed. Bradford thought they would celebrate Christmas privately in their homes with prayer, said Richard Pickering, chief historian and deputy executive director at Plimoth Plantation. Instead, he found the newcomers playing sports out in the open. 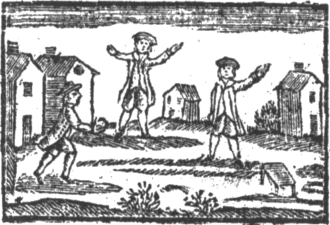 So he led-away the rest and left them; but when they came home at noon from their work, he found them in the street at play, openly; some pitching the barr and some at stoole-ball, and such like sports. Bradford then pulled a move that would be considered very un-Christmas-like today: he confiscated their toys. So he went to them, and took away their implements, and told them that was against his conscience, that they should play and others work. If they made the keeping of it matter of devotion, let them keep their houses, but there should be no gaming or revelling in the streets. In this account, written about 20 years after the event, Bradford claimed no one had attempted to celebrate publicly since. Though he remembered the incident as one “rather of mirth than weight,” Bradford was grieved by what he viewed as sacrilegious behavior. In 1659, the Massachusetts Bay Colony officially outlawed the celebration of Christmas, imposing a fine of five shillings on anyone found celebrating the holiday. The ban was repealed in 1681, but there was still little public notice of the holiday in Massachusetts until the 19th century, when more immigrants arrived from countries other than England. Christmas became an official state holiday in the Commonwealth in 1856, and a federal holiday in 1870.